The problem for me is two fold. 1) How do I center the cells so that you can see the middle cell as well as the one of the left and right. If I create cells that are square and add spacing between each cell, the cells are correctly displayed but are not centered. 2) With pagingEnabled = YES, the collectionview correctly swipes from one page to another. However, without the cells being centered, it simply moves the collection view over a page which is the width of the screen. So the question is how do you make the pages move so you get the effect above. I don't want to worry about this too much. If I can get that to work it would be great, but the harder problems are 1 and 2. The code I have currently is a simple UICollectionView with normal delegate setup and custom UICollectionview cells that are squares. Maybe I neeed to subclass UICollectionViewFlowLayout? Or maybe I need to turn pagingEnabled to NO and then use custom swipe events? Would love any help! In order to create an horizontal carousel layout, you'll have to subclass UICollectionViewFlowLayout then override targetContentOffset(forProposedContentOffset:withScrollingVelocity:), layoutAttributesForElements(in:) and shouldInvalidateLayout(forBoundsChange:). The following Swift 4.1 - iOS 11 complete code shows how to implement them. 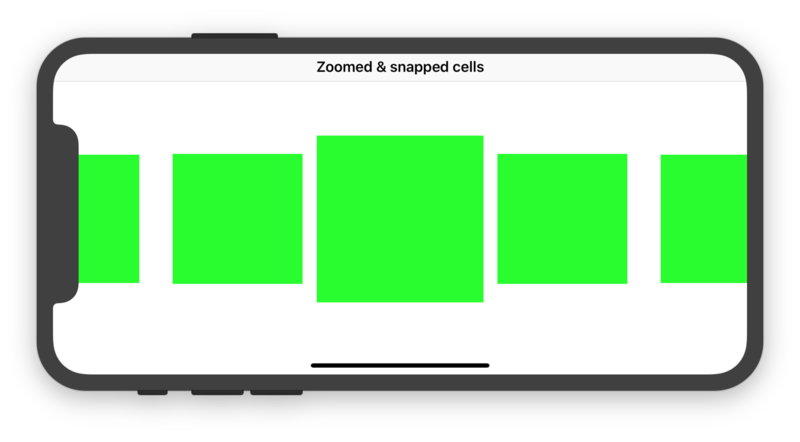 title = "Zoomed & snapped cells"
WWDC 2012 session 219 - "Advanced Collection Views and Building Custom Layouts"
Well, I made UICollectionview moving just like this, yesterday. // to get a size. // if cell's height is exactly same with collection view's height, you get an warning message. I wanted similar behavior a little while back, and with the help of @Mike_M I was able to figure it out. 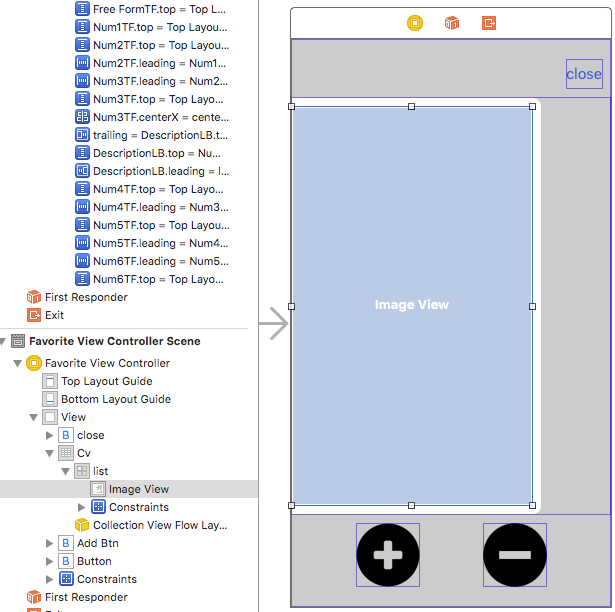 Although there are many, many way to do this, this particular implementation is to create a custom UICollectionViewLayout. 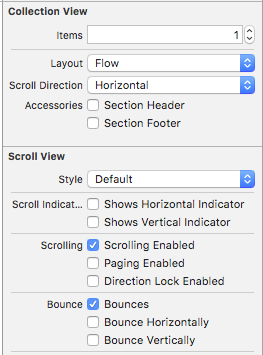 Now it's important to set the following: *yourCollectionView*.decelerationRate = UIScrollViewDecelerationRateFast, this prevents cells being skipped by a quick swipe. That should cover part 1 and 2. Now, for part 3 you could incorporate that in the custom collectionView by constantly invalidating and updating, but it's a bit of a hassle if you ask me. So another approach would be to to set a CGAffineTransformMakeScale( , ) in the UIScrollViewDidScroll where you dynamically update the cell's size based on it's distance from the center of the screen. Now set up a rule, that if the cell's center is further than x away, the size of the cell is for example the 'normal size', call it 1. and the closer it gets to the center, the closer it gets to twice the normal size 2. What happens is that the cell's size will exactly follow your touch. Let me know if you have any more questions as I'm writing most of this out of the top of my head). pagingEnabled should not be enabled as it needs each cell to be the width of you view which will not work for you since you need to see the edges of other cells. For your points 1 and 2. I think you'll find what you need here from one of my late answers to another question. The animation of the cell sizes can be achieved by subclassing UIcollectionviewFlowLayout and overriding layoutAttributesForItemAtIndexPath: Within that modify the layout attributes provided by first calling super and then modify the layout attributes size based on the position as it relates to the window centre. Not the answer you're looking for? Browse other questions tagged ios objective-c uiscrollview uicollectionview uicollectionviewlayout or ask your own question. Zoom Effect on Paging UIScrollView? Is it possible to swap 2 cells in a UICollectionView that is using UICollectionViewFlowLayout? UICollectionView Paging - How to page ,e.g., 3 at a time?